It is all smiles for the ten contestants who have made it through to the #FameLabSA finals! The competition is fast reaching its climactic end, when these young scientists meet each other at the FameLab South Africa 2017 final. The event will take place on the 19th of April 2017 at the Rand Easter Show, Nasrec, from 10am to 1pm. 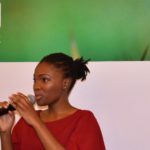 Only one contestant can be crowned the FameLab South Africa 2017 winner. They will walk away with an all expenses paid trip to the international FameLab final in the United Kingdom, and R5000 to spend. Two runners-up will each receive R2500. Jive Media Africa will be tweeting live from the finals on the 19th of April. @JiveMediaAfrica Tweet us with the hashtag #FameLabSA to show your support for the contestants! The South African #FameLab winner will be announced here on Jive’s FameLab blog, on Twitter and on our Facebook page. https://jivemedia.co.za/wordpress2/wp-content/uploads/2017/03/FameLab2017_semi_final_20170327.jpg 657 1988 Jive Media https://jivemedia.co.za/wordpress2/wp-content/uploads/2018/07/jive-logo-white-text.png Jive Media2017-03-28 07:54:542018-12-10 13:57:10FameLab SA 2017 Finalists!